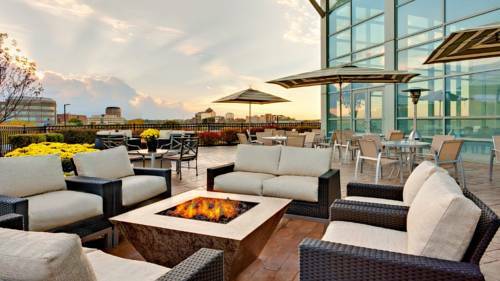 Discover the spacious accommodations, inspired amenities and superb service at Sheraton Overland Park Hotel at the Convention Center. Relax inside generous hotel rooms and renovated suites which feature plush Sheraton Signature beds, flat-screen TVs, ergonomic workstations and Wi-Fi; many rooms reveal sweeping views of the city. Our reimagined suites offer double sofas and expansive living areas. Club-level rooms grant access to the reimagined Lounge and amenities, including free Wi-Fi and breakfasts. Take advantage of Link@Sheraton, our indoor pool, the modern gym and free self-parking. Innovative comfort food with a Southern twist and refreshing libations are waiting to be savored in op1906 Bar and Grille's dining room and inviting outdoor patio. Organize events from weddings to board meetings in our 55,000 square feet of versatile venues. We're also directly connected to Overland Park Convention Center. When you are ready to explore, visit Arrowhead Stadium, Kansas City Zoo and Oak Park Mall. OP1906 Bar & Grille: Treat yourself to mouthwatering comfort food, prepared with Southern flavors and seasonal ingredients at op1906 Bar & Grille, the signature restaurant of our downtown Overland Park hotel, located steps from the Convention Center.